So my other love is chocolate. Lots of it. Give me it in milk, dark or white format. Throw in vanilla or chilli if you like. I don’t care. It’s chocolate. I like it melted, spread on toast, in hot drinks and even in my candles. You get it… I LOVE CHOCOLATE. It’s definitely one of life’s little pleasures. Even when it’s the day before payday, I can still afford a bar of Galaxy before the gas bill. So, when I found this amazing recipe at bakingmad.com I couldn't resist it. The recipe was first shown on Channel 4, so I knew before I started that it was unlikely to go wrong. Get ready for some biscuit bashing!! Line a square 20x20cm tin with greaseproof paper. In a medium pan placed over a gentle heat, melt together the butter, chocolate and syrup. Stir the mixture continuously as it begins to melt, once it is smooth and everything combined, remove from the heat and place to one side. The golden syrup gives it a great flavour! Using a sharp knife, roughly cut the honeycomb balls. 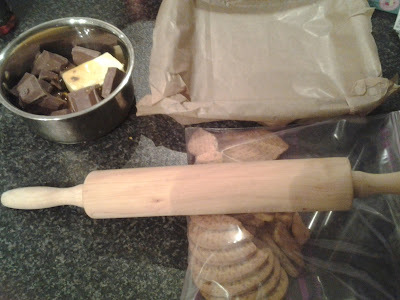 Place digestive biscuits in a bag and lightly crush with a rolling pin so you have nice chunky pieces. 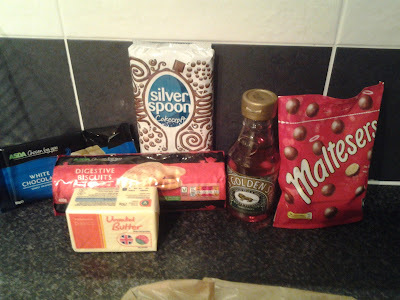 Add these to the cooled chocolate mixture and stir to incorporate. Pour into your lined square tin, press down with a metal spoon so you have a smooth, even surface and place in the fridge to chill until set. (Around 1 hour). To decorate, melt the milk chocolate. Spread a layer of melted milk chocolate over the surface of the chilled fridge cake and smooth out. Then sprinkle over the top of the melted milk chocolate your chopped Maltesers. 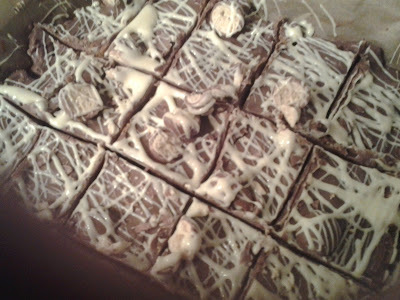 Using a teaspoon, drizzle over the top of the cake with lines of melted white chocolate. Using a sharp knife, first score into squares, then cut through the score marks. Store in refrigerator until serving. 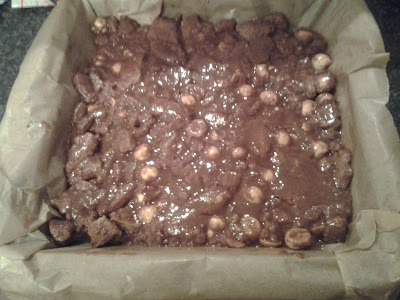 The traybake will keep in an airtight container, in the fridge for a few days (but I guarantee it wont last that long)! Silicone bakeware is ideal for this as it’s flexible and is easier to prize the cake out once chilled. Don’t worry if you are on a budget – own label ingredients are absolutely fine to use. Don’t break the digestives too small, as the cake will lose its bite. Try this recipe if you want to impress with something that’s really easy. 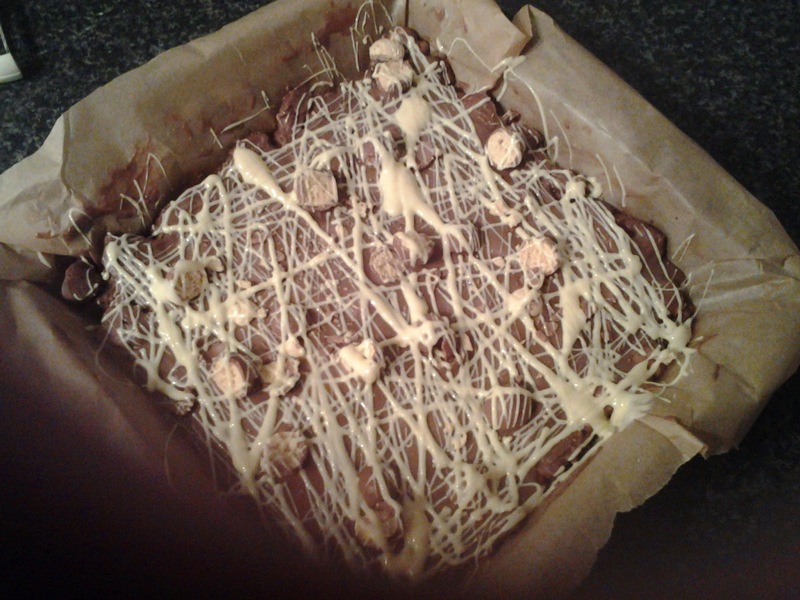 Even the most novice baker can give this a go, as there’s no cooking involved, only melting chocolate. I’m now thinking of other ways to put my own spin on this recipe. I’m thinking about trying a mint aero version next. Or perhaps Galaxy Minstrels with freeze-dried raspberries? Oh yes please Claire. YUM! Thanks Jac! It's so easy to make... and very moreish!!! !